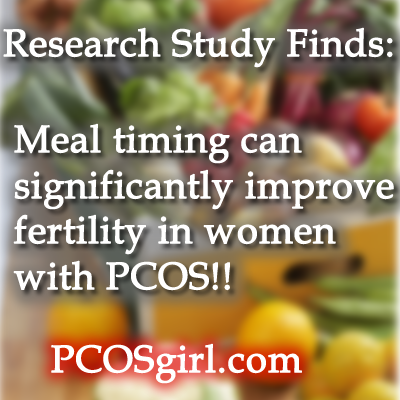 Meal Time Can Improve Fertility Naturally! Let me preface this with letting you know- I have been trying this meal switch for the last two weeks and have lost 7 pounds!! I will fill you in on the fertility part later. 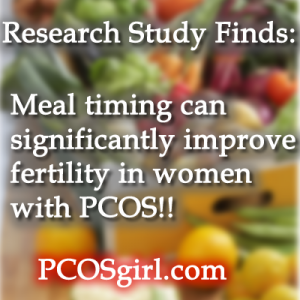 A study from the American Friends of Tel Aviv University has positively correlated eating a calorie dense breakfast, and then lower calorie meals throughout the day helped PCOS sufferers with their fertility. A common disorder that impairs fertility by producing an overabundance of insulin may be naturally treatable through meal timing. Research indicates that an increased caloric intake at breakfast can lead to lower levels of testosterone and a dramatic increase in ovulation frequency. The goal of her maintenance meal plan, based on the body’s 24 hour metabolic cycle, is not weight loss but insulin management. Women with PCOS who increased their calorie intake at breakfast, including high protein and carbohydrate content, and reduced their calorie intake through the rest of the day, saw a reduction in insulin resistance. This led to lower levels of testosterone and dramatic increase in the ovulation frequency — measures that have a direct impact on fertility, notes Prof. Jakubowicz. Sixty women suffering from PCOS with a normal body mass index (BMI) were randomly assigned to one of two 1,800 calorie maintenance diets with identical foods. The first group ate a 983 calorie breakfast, a 645 calorie lunch, and a 190 calorie dinner. The second group had a 190 calorie breakfast, a 645 calorie lunch, and 983 calorie dinner. After 90 days, the researchers tested participants in each group for insulin, glucose, and testosterone levels as well as ovulation and menstruation. As expected, neither group experienced a change in BMI, but other measures differed dramatically. While participants in the “big dinner” group maintained consistently high levels of insulin and testosterone throughout the study, those in the “big breakfast” group experienced a 56 percent decrease in insulin resistance and a 50 percent decrease in testosterone. This reduction of insulin and testosterone levels led to a 50 percent rise in ovulation rate, indicated by a rise in progesterone, by the end of the study. Ladies- I have been following the teachings above, eating my calories early and having a very light dinner. Guess what, I’ve lost 7 pounds in two weeks! Everything else is status quo – I only reorganized my eating. This entry was posted in PCOS, PCOS Infertility, PCOS News & Research, PCOS Weight Control and tagged pcos infertility. First off- this system really helps- I’ve already lost a solid 10 pounds! I eat dinner around 5:30-6. It’s a light meal, meaning no heavy carbs or second helpings. I eat no dessert (besides maybe Kettle Corn). I don’t eat anything after 7pm except maybe a bowl of popcorn or a banana. I’ve been walking for at least 10 minutes every night after dinner. I’m pretty excited about the weight loss! I eat all my carbs or sugar items in the morning, so I have time to work them out of my system.